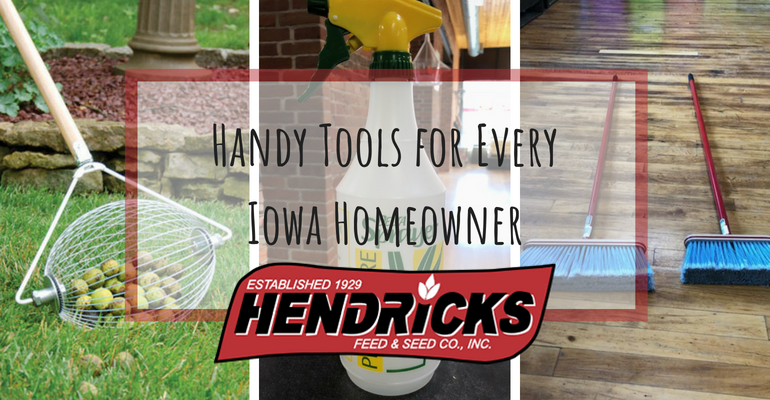 Handy Tools for Every Iowa Homeowner | Hendricks Feed & Seed Co, Inc.
Did you know that Hendricks Feed & Seed Co, Inc has you covered for tons of handy tools you need for inside and outside your home? Here’s a rundown of a bunch of tools you might find useful and that could make your life a little bit easier! Brooms – Great for the kitchen, we offer fine bristle brooms that are heavy duty but also lightweight. They come in two sizes, a large head broom and a small head broom. We also offer a push brooms both fine and course. Fine bristle is 36″ and the coarse Bristle is 24″. Large Wash Brush – If you have a job that requires scrubbing this could be your solution. This brush is also heavy duty but lightweight to make your job a little easier. Trigger Sprayer – For all of your house plants in the house or for cleaning, we have a great trigger sprayer available. It’s also great for outdoor use. Burlap Bags – Burlap bags are great for making sure your plants don’t freeze during the winter. Recently they have become part of the crafting world as well. Either way, we have you covered. Spreaders – We offer the Earthway Bag Spreader 2750. This tool is perfect for small seeding jobs, replacing the need to throw seed by hand. You can’t tear it because it is made of weather resistant nylon and the top zips close for easy seed loading. Handy! We also have the Earthway Spreader 2030 in stock. This is for lawn seeding on a larger scale. It is large capacity for larger lawns and is made to roll easily over lawns. Galvanized Steel Can & Watering Can – You just can’t beat galvanized steel as a heavy duty option around the house. Our heavy duty steel can holds fifty pounds of feed or seed (double that for the twenty gallon option). We have both a twenty gallon or a ten gallon option. The lid locks in place. Our heavy duty watering can holds 2.5 gallons but also has a great vintage look and would make a great planter. Both of these products are high quality and long lasting! The Nut Wizard – coming soon to your yard as Fall comes: NUTS! The Nut Wizard is a pretty magical tool that picks up walnuts, acorns, and more. All you have to do is walk around and roll The Nut Wizard while it picks up the nuts. There are two sizes to fit different objects. It comes with an easy unloader that fits on buckets or trash cans. Stop bending over to pick up nuts and do it the easy way with this great tool. We also have a selction of shovels, both plastic and metal for just about any job. Another great tool is a large squeegee, which can come in handy in the garage and around the house. Our goal is to provide you with as many tool and hardware options as possible to make your life a little easier. We hope to be the place you stop in Dubuque when you think of something you need for around the house. Click the button below to learn more about our Hardware Products!